ONYX BRAND….GUARANTEED FOR LIFE! The Onyx Collection manufactures shower bases, shower pans, tub replacements, lavatories, tub surrounds, fireplace hearths, slabs, seats, trim and other shower accessories to your specifications in almost any size, shape, and color, for your new or remodeled bathroom needs. No re-using old worn out valves. This is a REAL Bath/Shower wall system! Dalco is a manufacturer distributor. 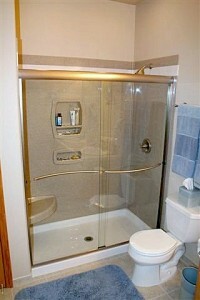 We will come to your home, remove the old tub or shower pan, surround and drywall. We will install a NEW shower floor or steel tub, NEW valve, NEW moisture resistant drywall, NEW Onyx brand surround, NEW drain and overflow (if required). AND… the Onyx surround is Guaranteed FOR LIFE**! For more information regarding Onyx please see our “Manufactures Link” page or click here to go to Onyx. This statement is on every product we manufacture. It is a simple, clear guarantee, and everyone associated with our business understands it. If our product ever fails, we will either provide you with a new item or refund the cost. “Yes, Guaranteed Forever” says it all. Quality products, our guarantee, quick delivery, ease of installation, and low failure rate have made us legends in this industry.